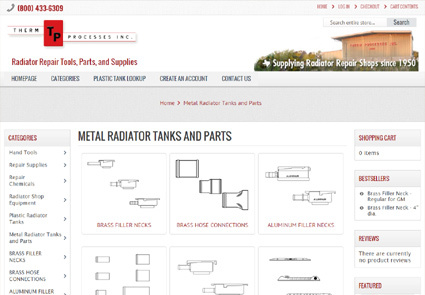 Centerforward Web Services, LLC – Therm Processes, Inc.
You are here: Home › Therm Processes, Inc.
CWS launched an ecommerce storefront for Therm Processes, Inc. to sell radiator repair products worldwide. The site is secure, accepts Visa, Discover, MC, Amex, and Paypal, and adjusts beautifully for smartphones and tablets. CWS worked with Therm to prepare over 2500 products and product images, and organize various product attributes and options. See the store live at www.thermprocesses.com.